It’s no secret that the manufacturing industry is experiencing a skills shortage. With demand growing and manufacturing being as a key industry for the UK following Brexit, one way that manufacturers can bridge this skills gap is by utilising their Apprenticeship Levy. 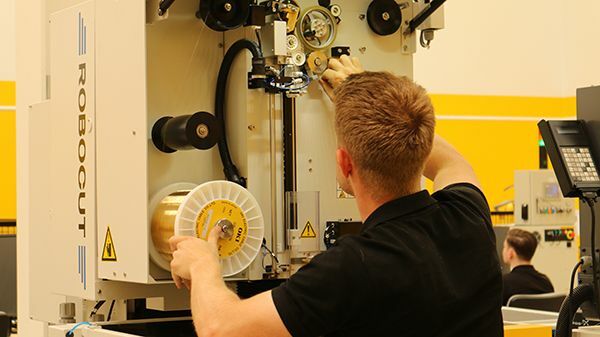 FANUC UK is one of the many UK manufacturers that welcomes apprentices to its Coventry facility. Working closely with its neighbours, the Manufacturing Technology Centre (MTC), FANUC has recently welcomed two of MTC’s ‘gold standard’ apprentices, Oscar Pickerill, 20, and Ben Farmer, 17. Here, they explain why they made the decision to seek a career in manufacturing. Oscar and Ben both joined the MTC apprenticeship programme in September 2016 after deliberating the options presented to them by their schools. Despite university being heavily promoted, both students decided to look for work experience and apprenticeship opportunities after leaving school. While this was a challenge for Ben, whose school didn’t provide a work experience programme, he believes that applying for an apprenticeship was the right pathway for him and that more people his age should consider it. “I needed something that I was passionate about. After successful work experience placements at Jaguar Land Rover and a civil engineering company, I knew I was interested in a career in manufacturing. After sourcing the apprenticeship programme with the MTC directly, Oscar and Ben successfully interviewed for a place on the programme. They are now working with FANUC as part of its extensive two-year apprenticeship programme after a successful work placement. Based in Coventry, the MTC offers a range of award-winning apprenticeship programmes in advanced engineering as it looks to make a significant contribution towards solving the skills shortages within the manufacturing and technology industries. The MTC also works with manufacturers, offering them the opportunity to use their Apprenticeship Levy to fund engineering apprentices who will gain training experience in product design and development. In 2018, the MTC announced that it would aim to recruit 96 apprentices in September with plans to triple that number by 2020, as candidates continue to successfully lead careers in UK manufacturing. FANUC UK is one of the manufacturers that works with the MTC to hire and support apprentices. With its Managing Director Tom Bouchier a former apprentice himself, they are embedded into FANUC’s culture. As it stands, 10 per cent of FANUC’s UK staff is currently made up of apprentices. Kerry Booth, HR Manager at FANUC, explains why apprentices are important to the business: “Choosing a manufacturing course isn’t always the first sector schoolchildren consider and this is something that industry needs to address because it is such an exciting environment for young people to be a part of. As automation continues to play such a big role in day-to-day life, having the opportunity to future-proof your career in such a rapidly developing industry is an exciting prospect. FANUC’s apprenticeship programme is designed to offer students the chance to work across the entire manufacturing process. Learning about the whole business is key to the development of the apprentices and allows them to understand where their interests lie. Selecting the right apprenticeship is a daunting process and manufacturers need to make their vacancies accessible and understandable. FANUC regularly keeps its apprenticeship page updated with the latest opportunities, whilst ad-hoc applications are also encouraged. By making apprenticeship opportunities more available, the UK manufacturing industry has a fantastic opportunity to encourage more applications which can help develop the future generation of the industry.